This Autumn I'll be a visiting artist during the Justice artist-in-residence intensive with Golden Dome Mystery School. Though my own contribution will be a 2-hour class on one of the days of the intensive, the overall offering looks like an amazing synthesis of many modalities close to my heart on a subject deserving much, if not all, of our attention at this time. Justice takes place from September 30th - October 7th, 2018 in Wurtsboro, NY. Applications will be accepted in a rolling basis until August 15th. 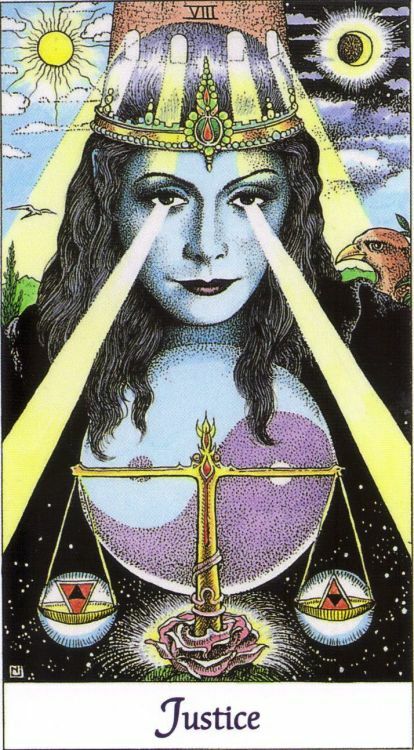 For our ninth artist-in-residence session we will be working with the Tarot card “Justice” where we are introduced to the mysteries of law, order, balance, and equilibrium. The figure pictured as “Justice” on most Tarot decks is modeled after the ancient Egyptian Goddess Ma'at, with her balancing scales and magic feather (often pictured as a sword). The concept of Ma'at, which is personified as a Goddess, is a more fluid and pervasive notion than ‘justice’ or ‘law’ as we now understand these words. Ma'at is the ultimate force that operates the cosmos – she is an energy that maintains balance, regulates the movements of the stars and the cycles of the seasons, keeps cycles of life and death in balance, and creates complex, synergistic, and self-regulating systems of order that maintain creation. Ma'at’s ideological opposite is Isfet - injustice, chaos, and violence. During this artist intensive, we will seek to understand how principles of justice and balance can be found in ourselves, our communities, our world, our planet, and our cosmos, as well as navigating our relationship with Isfet - injustice, chaos, and violence. Through combined practices of performance, community building and magic making, we will study the balancing forces in nature as they pertain to renewal and revolution. We will be living communally in a house in the Catskills for a one week session that consists of a series of performance centered art exercises, tarot instruction, sound healing, intuitive development exercises, and lectures offered by visiting artists. We will do a group performance at the end of week. All Golden Dome gatherings seek to provide our community with expansive methodologies for reconciling our selves and our work to each other and our world. Please see the syllabus for detailed information on course offerings. Information about the site for this residency can be found HERE. The faculty members for the “Justice” program are: Chiron Armand, Mireya Lucio, Linda Montano, Cory Nakasue, Lavender Suarez and Eliza Swann.